Be Different...Act Normal: Wanna Hang Out With Me In Louisville, KY? Wanna Hang Out With Me In Louisville, KY? The lovely people at GE have invited me to the GE Monogram Experience Center in Louisville, Kentucky for the GE Momsperience on May 15-17 and they have invited one of you too! So do you want to come? They will fly you to Louisville on May 15th and have you back on a plane home the afternoon of the 17th. It will be a short trip, but one that they promise to be full of "luxurious learning and sharing (and even some cooking!). They will take care of all of the arrangements and you and I can hang out and enjoy the 10,000 square foot 'theater for the senses". 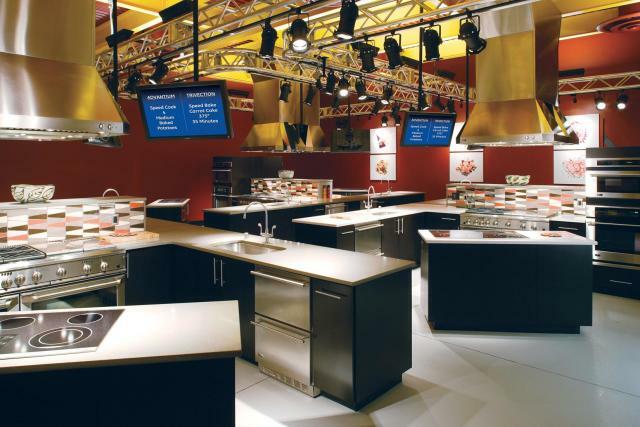 The GE Monogram Experience Center was designed to showcase the latest and greatest in GE Monogram appliances to builders, customers, and designers, and now they want to show it off to us! So if you want to hang out with me for a couple of days in Louisville and you are free May 15-17, here is how you can enter to win the trip. First, you must be a follower of the blog. So if you aren't already, go over and click the little follow button! Then, leave me a comment on this post. If you want a couple more chances to win, AFTER you have left a comment on this post, you can get another entry by leaving a comment on any and all posts from now until midnight (CST) Wednesday April 20, 2011. One comment per post. I am REALLY excited to get to meet and hang out with one of you! I could have taken anyone with me and I was tempted to take my best friend or my sister, but I figured this was a unique chance to get to know one of you. Of course, if I already have the pleasure of knowing you, you can still enter. The winner will be contacted on April 21. I need to have your information in to them on that day, so PLEASE make sure to leave me with a way to contact you or I will have to select another winner. And that would be sad! I've been reading your blog for quite a while and now it is the first one I have joined as a follower! Love GE appliances and dream of redoing my old farmhouse kitchen with them. Good luck to everyone who enters and thanks for this opportunity. Are you kidding me!!! I'm so in - sounds like a blast. Totally game for this one!! What an awesome giveaway. I follow. Wow! this would be so fun! I would LOVE to attend. I've been following your site for some time now. It's my first read in the morning. Pick me -they could make one name tag and print it twice!! !Hehe This would be a treat for this unemployed lady! You can email me @ mhilton05@yahoo.com or find me @ Bacon Time with the Hungry Hungry Hypo. I live in KY!! No one ever comes here. How fun to have you in my state! I follow and would love to come! thats the weekend of my birthday and what an awesome present this would be! Love your blog and all your ideas and glad you thought of your followers! I would love to go, how fun! I follow you via Google Reader! Yay! I am a follower and would LOVE to come with you. What an awesome experience!! I am a follower and would LOVE the chance to win! Hmm.. I mean "go." That's my middle name! That would be freaking awesome! Such an amazing giveaway! I wanna go with you! I would have to pinch myself if I won...seriously! That would be too awesome! I would love to go!!! Oh my gosh! I don't think I've ever wanted to win a giveaway so badly! This would be fantastic! And the timing is perfect because my husband will be on a break from school and can stay home with the girls and I need a break so, so badly! I'm crossing everything I can for this one! I can be reached through this profile or my other blog is creating-sarah.blogspot.com (e-mail creatingsarah@gmail.com). I'm a follower on both accounts. I follow! Love this site! Sweet!!!!! I follow you (is RSS subscription what you mean? I didn't see GFC...let me know if I missed it!). I follow your blog :) Thank you for the chance! sounds like a great way to spend a couple of days! That would be very cool! You wouldn't even have to fly me out because I live two hours from Louisville! What a cool opportunity :) I want to play with you! Girlfriend...hello?? Louisville and I go hand in hand! Come on, you know you want to take me! i am already in KY so no flying necessary!! This sounds like sooo much fun, hope I win. I'm totally into meeting new bloggers and I'd love to meet you!! Me, pretty please! I'd love to come hang out with you Miss Lorie! Are you kidding me?! I would love the chance to hang out with you and well GE would be a total bonus! Lori, you KNOW I would LOVE LOVE LOVE to hang out with you ANYWHERE, let alone some place like that....I hope I win! Oh, wow, what a treat it would be to meet you and see Louisville!It's still cool here in Massachusetts, so I'm sending "warm" thoughts! I am a follower and would love to meet you! Fingers crossed! I'm pretty sure you will have the most fun if you choose me! And I would love to meet you. I would love to go!! Sounds like so much fun!! This would be fun, I actually LOVE appliances. This is the best giveaway in HISTORY! After 3 days of trying to figure out who would watch my kids I still have no clue, but I'm leaving a comment anyway, just for the chance to dream. AWESOME!!!! This would be a BLAST!!!! I follow your blog through GFC, and I'd love to join you for this trip! Sounds like fun! Haven't been to Louisville in such a long time and I'd love to go! I am a new follower. I would love to get to know you in person. I am now a follower, though I have been reading this blog for a lot longer. Ummmm yes please! not quite early enough to deliver my baby, but early enough I still have all my energy and we'd have an absolute BALL! Because I'm totally fun and awesome (I promise I really am). Plus learning sharing and cooking? Perfect weekend EVER! oh and just in case (cause I'd hate to miss it, imtopsyturvy at aol.com! Long time reader, first-time follower :) (I just started blogging myself and getting into the whole following-thing) Sounds like a super fun trip! !